Location: At S side of Manorbier Churchyard in the grounds of Church Hill Cottage. On the site of Church Hill Cottage is structural evidence of perhaps 5 buildings. 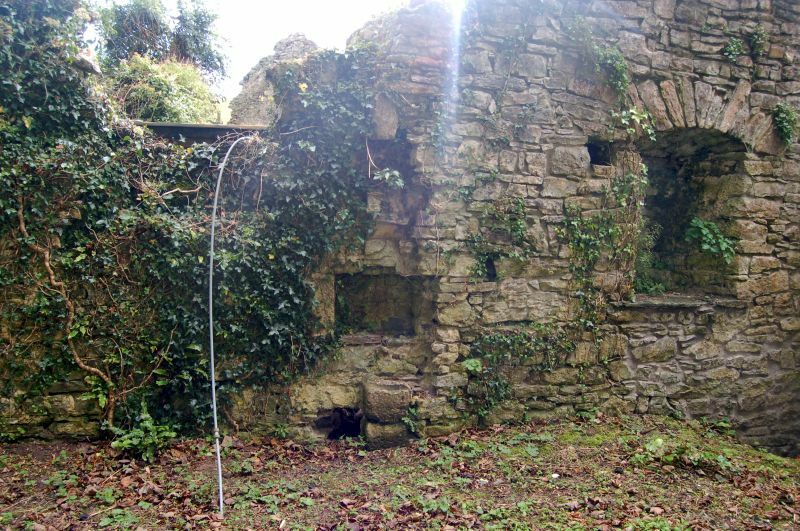 It is traditionally thought that these buildings are (or incorporate remains of) a grange established after Sir John de Barri granted the Church to the Priory of Monkton in 1301. Building ‘A’ consists of 2 surviving lateral walls. It is the same width as the cottage but uncertain lengths. Small-rubble masonry without dressings or any architectural detail. A doorway at N, facing into the churchyard, 2m wide by 2 m high with a segmental arch. There are remnants of a tiled lean-to porch roof at this doorway. There is no opposed doorway in the S wall. At its W end abutting Church Hill Cottage are 2 small rooms. Seen from the churchyard there is a slit window at left of doorway and a remnant of a spiral staircase at the right, the latter mostly blocked by the later corner of the adjacent cottage. The spiral rises anticlockwise. At the other side of the building, facing S, is an opening with a crude segmental head, later reduced to a smaller opening. Listed as a set of buildings in a very important historical relationship to Manorbier Church and also for group value with Church Hill Cottage. At S side of Manorbier Churchyard in the grounds of Church Hill Cottage. At S side of Manorbier Churchyard, uphill from the S porch. 200 M SW of Manorbier village, on a hill opposite to the Castle. At left of the road o the approach to Manorbier Church from the village, beside a stream. At the SW end of a small plantation about 100 m SW of Manorbier Church. Prominently sited at the S end of Manorbier village.